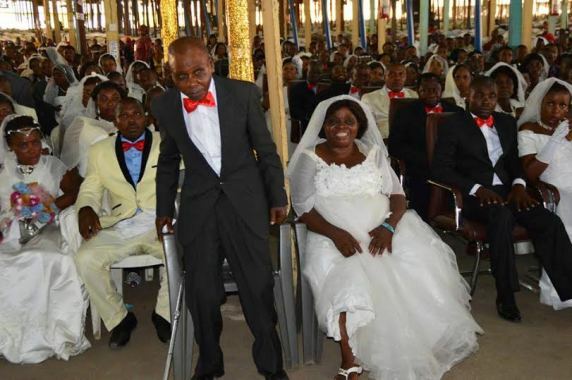 The 72 year old man and 60 year old woman who have been living together for more than 45 years without bride price and marriage were joined in Holy Matrimony today, Saturday, February 20 at Omega Power Ministries, Port Harcourt. 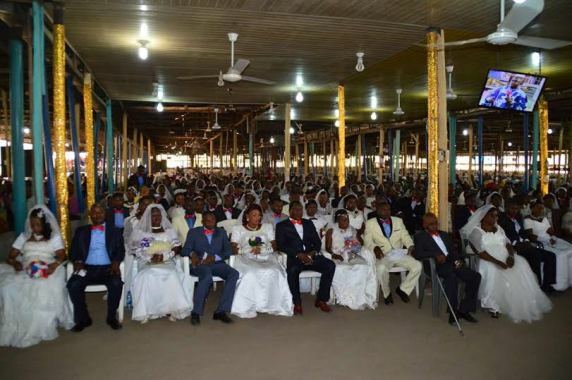 The church announced the good news on their Facebook page, adding that they bankrolled the weddings of other 140 couples who have been living together for many years without legal marriage. 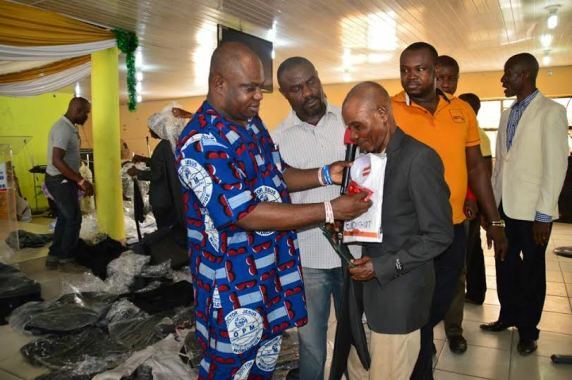 They provided money for the bride price, wedding gown for brides, suit, shirt and even ties for the grooms absolutely free of charge. "Why did I decide to do this ?" the Pastor asked. "Every day I get sleepless night because of the amount of people living together when God has not joined them. IT IS A SIN BEFORE GOD. Do you know that; one out of every five people you see in the street are living together without being legally married," he said. "If Rapture happens now , they will all miss Rapture. So what is the solution ? Solution Number one: Couples must Live apart until you get money to WED. Which is very risky. Any of those women can be my sister or maybe she already has 5 children. The woman will suffer. And a strange woman may take advantage to come in. Solution number two: Legalise their union. But many don't have money to legalize it. 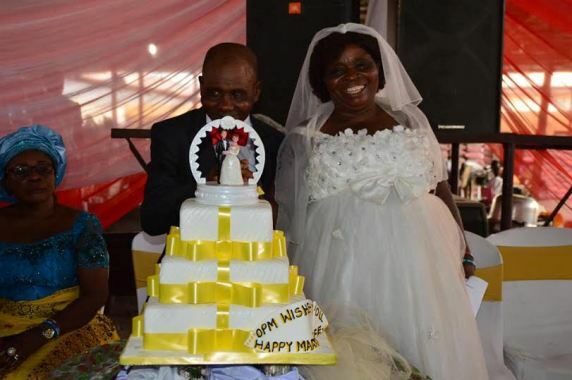 They already have children, but no money to pay bride price. So that is why I decided to intervene, so when Rapture happens they shall not be found wanting. "What is a church building when the people inside the building have visa to go to Hell-fire. Salvation is better than beautiful church building.This is why I conducted marriage blessing for 140 couples @ OPM headquarters. 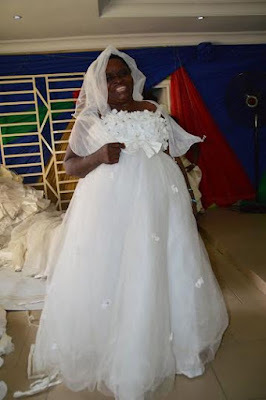 By the grace of God, I gave them money to pay bride price which they have traveled and come back after paying. I bought wedding suits and gowns including shirts and tie for 140 couples. Paid for marriage certificate and paid for food, drinks that will be used for their reception. Now I can sleep well knowing that extra 140 souls have been added to the kingdom of God." Congratz,pastor u don try do your own part too but poster,my question be say,what of if the girl papa and mama don die,who them go pay the bride price give? Congrats to all the celebrants but most especially to God almighty for opening the man of God's eyes&mind to see&help those couples. Congratulations to d couple and others.